"My mom bugged grandpa for this recipe but he told her he didn't have one. So, when he made the bread one day she captured each ingredient in a bowl and measured it and put it in the bowl he planned to mix it in!" In a medium bowl, mix together the flour, baking soda and sugar. Toss the raisins with the flour mixture until coated. Make a well in the center and add the egg, buttermilk, and melted margarine. Stir until all of the dry ingredients are absorbed. Turn the dough out onto a floured surface and knead for a few quick turns just to even out the dough. Handle the dough as little as possible. Pat into a flat circle, and place into the prepared pan. Yummy! This one was so incredibly quick and tastes great. I actually didn't have buttermilk so I substituted 1 cup plain yogurt (what the Joy of Cooking suggests as a substitution). A perfect, fast recipe. I've made it twice and it's been great both times. I usually like to fool around with ingredients but there's no need to with this one. Good stuff! This is a very easy to make, wonderfully moist bread! I topped the bread with a melted butter & powdered sugar frosting. 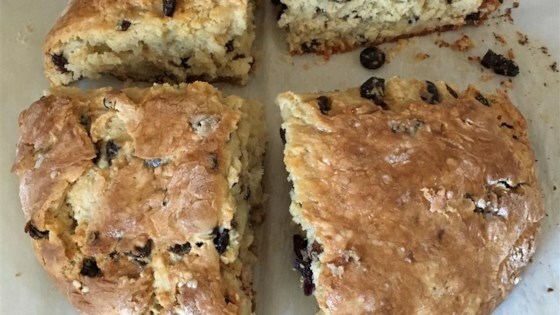 Sent looking for a simple irish soda bread minus the carroway seads (sp) but with raisens and this one fit the requirements. Used golden raisins just because that is my preferance in baking.. I used olive oil instead of margarine, and soy milk instead of the buttermilk. I also added salt, and it was pretty good! We ate almost the whole loaf right away.